Rome, one of the most iconic cities in the world. A city at the tope of everyone’s bucket list. Rome, the very first city I discovered in Europe has quickly is usually everyone’s first stop in Europe. Depending on the type of traveler you, Rome could be visited by plane, cruise or train. I’ve visited Rome every which way and it’s a different feeling each time. When Rome is discovered by land there’s usually more time to immerse yourself in the culture, in the sights, and let’s be real the food. Pasta in Italy just tastes better. When you visit Rome by cruise ship there are few hours to visit the city. The point of a cruise is to give you a little taste into a lot of destinations for you to decide if it’s a place you’d like to return. A cruise is also a great way to see a lot of places in in a short period of time and on a budget. There is no way you can see all of Rome thoroughly in 1 day I’ll tell you the fastest way to get all of the sights done quickly in 1 day. The port of Rome is called Civitavecchia, which is roughly an hour and a half from the city of Rome. The most economical and fastest way to get there is by train. The train from Civitavecchia drops you off right in front of the Collosseum. 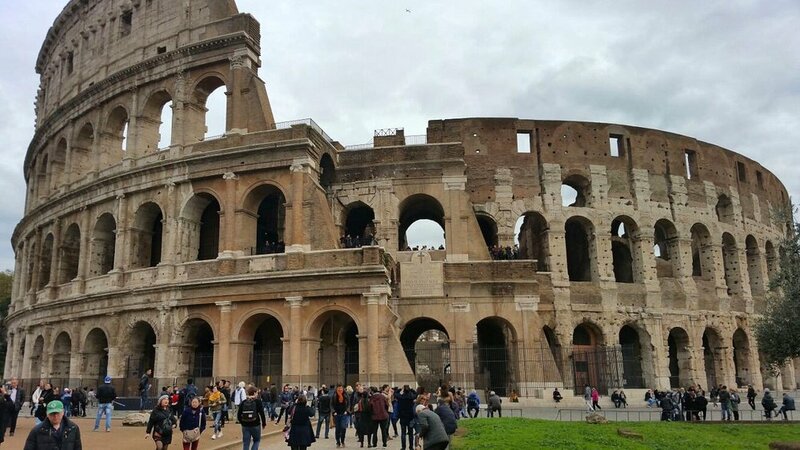 There’s not enough time to walk into the Collosseum but you can admire it from the outside and take your picture and go take a walk through the Roman Forum. From the Collosseum we took a walk to Pantheon. Fun fact about me this was my 4 visit to Rome and I had never visited the Pantheon before. At the Pantheon, we decided to grab a bit to eat from a hidden restaurant & eat right on the steps while half of the group went in. Next on the list was the Trevi Fountain, being the middle of November, which is considered off-season. It made all of this fairly easy. There weren’t many tourists doing the same things we were. The streets weren’t as crowded, which made it all a lot easier to get around and the sites were more enjoyable than before. The Fountain of Trevi was basically empty compared to my first visit there. We were able to visit the fountain toss a coin and make our wish. We also decided to make a quick stop at the Spanish Steps. When I visited the first time, the Spanish Steps were so crowded you couldn’t even go up the steps. There were people sitting literally all over the steps. This time they were basically empty. Perks of travelling during the off-season. After this it was a rush to find a taxi to take us to the train station to get back to the port. If you aren’t as rushed as we are I suggest the bus. Public transportation is very reliable in Europe; we were actually waiting for the bus when we realized if we didn’t make it across the city in the next 30 minutes we were going to miss our cruise. After that it was a seamless run through the train station to catch the last train back to Civitavecchia.